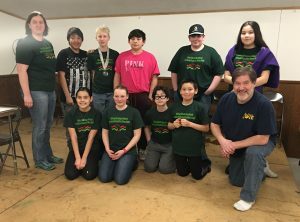 Several junior high students in the rural community of Galena, Alaska, made nationals in the Academic Pentathlon. The Academic Pentathlon a program that is open to any student who is in sixth through eighth grade. It begins in July and runs throughout the majority of the school year. Unfortunately, the school didn’t have the funding to fly them to Omaha, Nebraska, where nationals will take place. “We weren’t expecting to make it to nationals this year,” said Dr. Huntington. Students take online exams and if there score is high enough, their school earns a spot at nationals. Students that have participated in the successful run this year includes Milo Huntington, Aaren Sommer, Cassidy Huntington, Larry Wholecheese, Grace Boyers, Jed Ruchti, Preston Kopp, Isabella Marks, Sable Scotton, and Ian Esmailka. Around the end of April, the students will fly to Seattle, Washington, for 5 days to visit the U.S. Center, The World Rhythm Music Festival, and other places in Seattle.